Last week I started my series on Winter Wellness and part one investigated which foods could help fend off a cold. Today I'm looking at how certain foods can boost your mood and beat the winter blues. Sometimes it really does feel like the Winter drags on, there might not be any snow, but the days are short, cold, damp or icy. Recently we've been having a spell that's freezing cold one day, warmer the next (no ice in the morning) and then back to being cold the next day again but with an ice-chilling wind thrown into the mix! The weather just can't seem to make its mind up. You wake up in the dark and by the time you finish your days work and start your journey home its dark again. The Winter months are enough to get anyone down in the dumps, whether you're scraping the ice off your car or waiting in the cold and wet conditions for public transport, winter does seem to drag on. But wait, could there actually be a reason why you feel so drained of energy and feeling miserable? Enter Vitamin D! Vitamin D is made by our bodies from direct sunlight and in the winter months especially here in England where we have shorter days we are not exposed to enough direct sunlight. Even in the Summer months we will only be exposed to about four hours a day of direct sunlight and that's if we're outside! From the small amount of research I have undertaken it has been confirmed that you won't be able to eat your way through winter and get enough vitamin D, but I do have some good news. There is one food that does contain some vitamin D and I absolutely love it - those who know me well, will have already guessed - Yep its mushrooms! The amazing 'shroom is able to make vitamin D when it is exposed to ultraviolet light. But there is a downside, most mushrooms are grown in the dark and therefore do not contain vitamin D! However there are certain varieties that are grown in environments which use ultraviolet light to encourage the creation of vitamin D. We just have to find them! 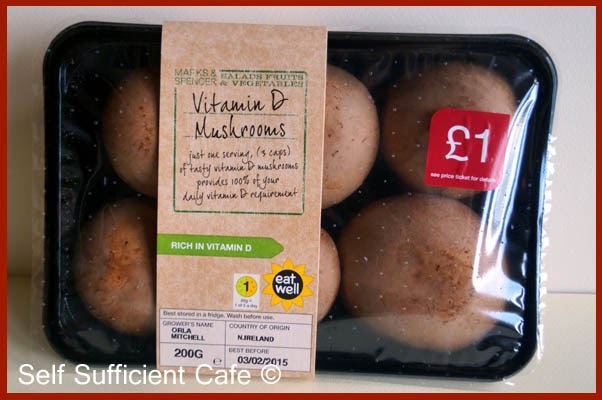 After a quick internet search Marks and Spencer came up trumps with their "Vitamin D Mushrooms". Their packaging says it all: "just one serving, (3 caps) of tasty vitamin D mushrooms provides 100% of your daily vitamin requirement". 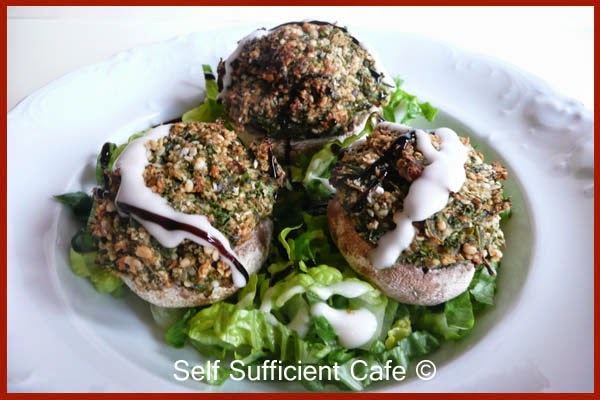 One more reason to love the 'shrooms! Foods which are high in omega-3, magnesium and the B vitamins are the champions of well-being winter wellness! Vitamin B12 is an important vitamin as it's job includes helping produce brain chemicals that affect your mood. Flax Seeds - These bad boys are one of the highest sources of omega-3 fatty acids, which over the years have said to be beneficial to your health in numerous ways, including the potential to influence your mood. Get sprinkling! Chia Seeds - Another great source of omega-3's, important for brain health. Hemp Seeds - Yet another great source of omega-3's with the added benefit that they also contain many B vitamins. It has also been reported that hemp seeds can improve your mood and even alleviate symptoms such as depression or anxiety. Leafy Greens - Get munching on kale, the daddy of leafy greens! Other top leafy greens include spinach, swiss chard and other collard greens. They provide so many nutrients including high amounts of vitamin C, magnesium, B vitamins, calcium, fibre and omega-3's! Super Green Smoothie anyone? Brazil Nuts - A great source of selenium, which affects your mood, insufficient levels of this nutrient can make you irritable, anxious and generally just feeling done in. Oats - Releasing their energy slowly thanks to their low glycaemic index, will keep your mood stable as well as your blood sugars. Bananas - A good source of vitamin B6 and magnesium, which provides you with energy to help you combat the day. Berries - I've added berries to the list as they help from the side lines. When you are already exhausted and have nothing left to give its very hard to stay upbeat, especially if stress hits, in any form. Berries are the stress busters, so when you need that extra help reach out for a handful of berries rather than your typical comfort food. Fortifed foods - Some foods such as Nutritional yeast (yummy cheesey flavour) are fortified with vitamin B12 and some cereals are fortified with vitamin D, just check the ingredients to make sure they are vegan. Supplements - You may decide that taking a supplement is also beneficial to you, but that's a personal decision which I won't try and influence you on either way. As you can see from the list above there are some foods which will help with your well-being as well as boosting your immune system. So lets get cooking and introduce or increase our intake of these foods into our diets. Mix the ground flax seed with the cold water until combined and place in the fridge while you prepare the rest of the ingredients. Place the oats into a food processor and whiz to a flour consistency and pour into a bowl. De-stalk the mushrooms, trim the stalks and place in the food processor. 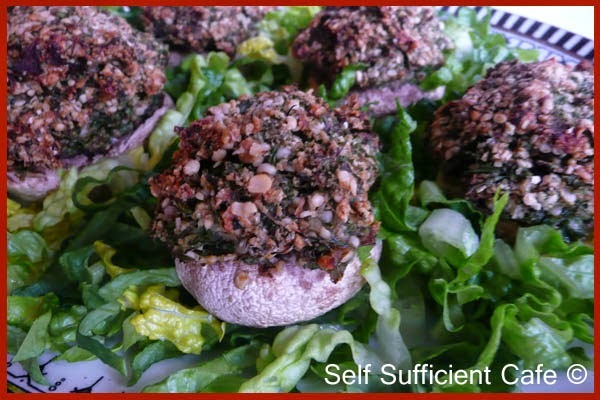 Put the mushroom caps topside down on a baking tray and put to one side while you prepare the stuffing. Add the garlic to the food processor and whiz until finely chopped. Add the kale and whiz again until the kale is cut into small pieces. 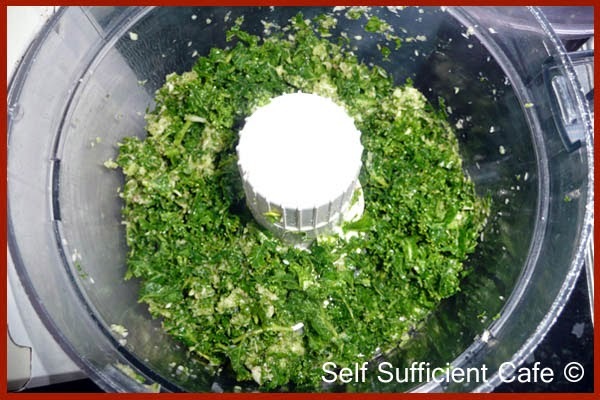 Tip the kale mixture into the bowl with the oat 'flour'. Add the hemp seeds, ground almonds, nutritional yeast and salt and pepper and mix thoroughly. Add the soy sauce and the chopped chives and give everything another good mix, it will start sticking together, which is what you want. Spoon the mixture into the mushroom caps, pressing the mixture down as you go. You will have a fair amount of stuffing so pile it high! Bake in a moderate oven for 20 - 30 minutes, if the tops start to brown, place some foil over the dish for the last 10 minutes or so. 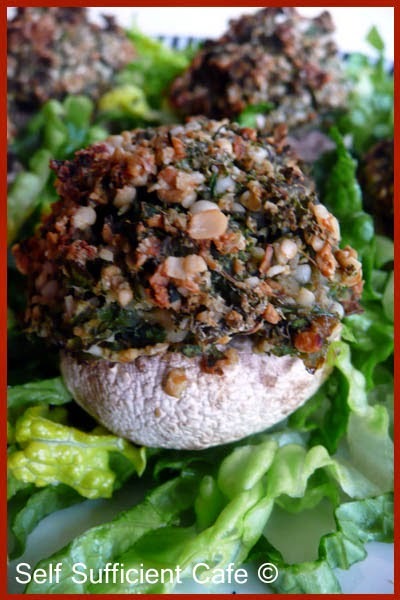 The loaded 'shrooms are great with a little tahini sauce, balsamic glaze or a little vegan mayonnaise or like me a combination! If you like sticky sweet treats, then sorry, these aren't for you, but remember refined sugar isn't that good for you! 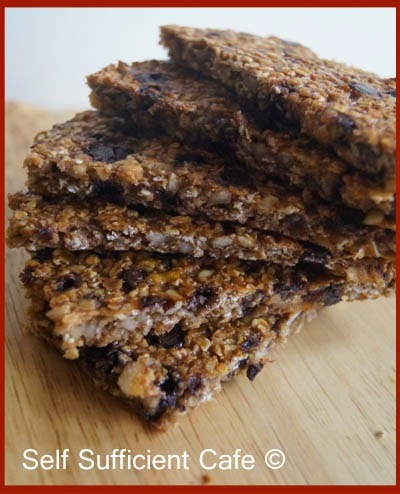 There is a little sweetness in there from the agave nectar and then when you bite into a piece of date or cranberry you get a little extra sweetness which I find is just enough to tickle your taste buds especially for breakfast on the run or a quick happy bite! Line a baking tray with grease proof paper so you can easily remove the happy bites after cooking. Put 150g of the oats into a food processor and whiz to a flour consistency. Pour into a bowl with the remaining oats. Add the walnuts to the food processor and whiz until finely chopped, pour into the bowl with the oats. Add the remaining dry ingredients and give everything a good stir so it all combined. Pour the wet ingredients onto the dry ingredients and top with the flax mixture from the fridge. Give everything another good stir and transfer to the baking tray. Bake in a moderate oven for 20 minutes, they will be ready when the tops are golden brown and they have a little spring when they are pressed. Remove from the oven and let cool in the baking tray before removing. 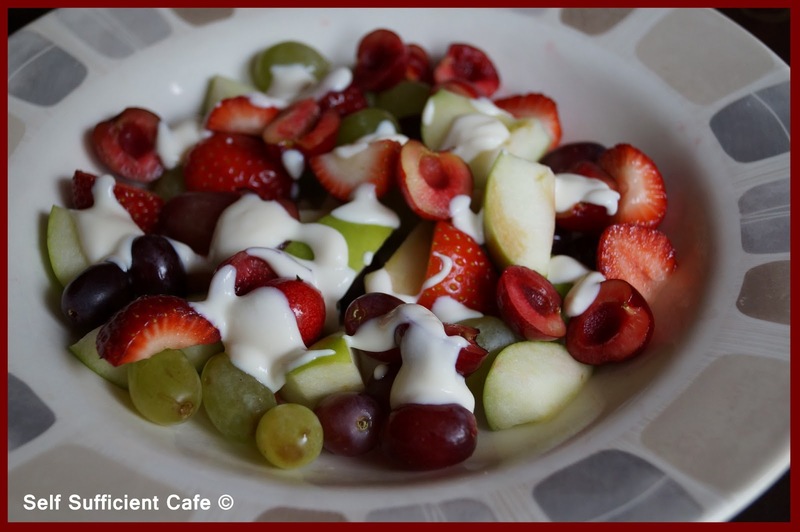 Enjoy for a quick on the go breakfast or a snack to keep you smiling. I think adding some berry goodness in the form of blueberries would be a great addition! To keep you in top form I thought it would be nice to share with you two more of my well used aromatherapy blends. Drop the oils into the water and as the candle warms the water and oils the fragrance will circulate your room. To me the benzoin essential oil is like a big cuddle and the jasmine and lemon give you a lift. If you want to use as a room spray, add water to a small spray bottle and add 3 drops of benzoin and lemon and 2 drops of jasmine. Shake before use. Sometimes, when we are stressed, tired or finding it difficult to switch off our thoughts we may find it difficult to sleep. If that's you, then this blend is for you! You can use the oils as a bath soak to help you unwind or use in an oil burner. Please check that the aromatherapy oils are suitable and safe for you to use personally. Winter Wellness - What does that mean to you? How well are you during the winter months? Are you constantly fighting off a cold or some other nasty bug? Or are you prone to cold after cold and fed up of a runny nose or constant sneezing? Have you been faced with taking to your bed with a chest infection or the flu? There are so many colds, bugs and viruses that seem to be flying around at the moment and I seem to be surrounded with people who are fighting off one illness or another. Maybe you're keeping the winter bugs at bay but you're feeling quite down in the dumps. Does the cold and lack of sunshine impact on your mood. Do you dread the dark mornings and dark nights and feel deprived of sunshine? Do you dream about far away shores, where you can almost feel the warmth of the sun on your back whilst you walk along the beach smelling the fresh sea air. Maybe like me you seem to have a handle on the attack of the bugs and viruses that are out there and can just about handle the short winter days knowing that spring is only round the corner but you are suffering too. I seem to be having various 'flare ups' of inflammation, bursitis, tennis elbow, sciatica, now that doesn't sound too healthy either does it? I'm not alone either I know of others that are suffering with some pain due to inflammation. 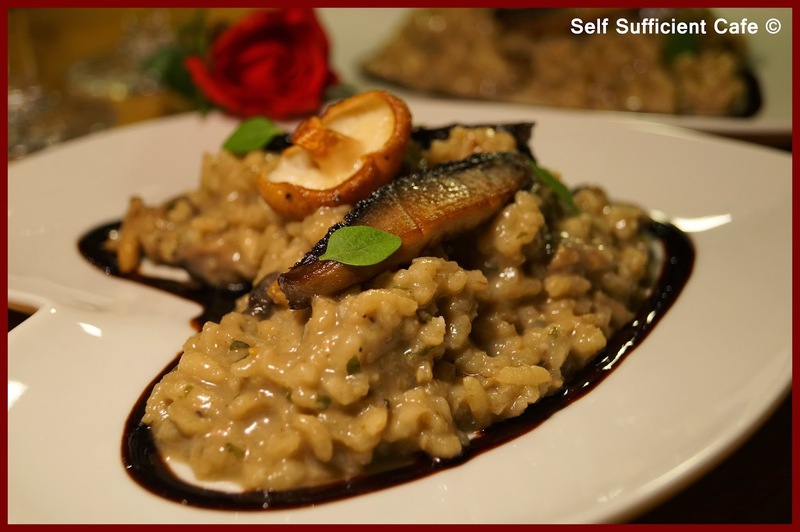 With all that in mind I decided to investigate further and see if your diet can help you fend off the bugs, make you feel brighter and put a stop to musculoskeletal pain. I was actually amazed at what my little amount of research found and I for one will be making some changes to my diet, staying vegan of course. Today I'll be sharing with you two recipes; a smoothie for breakfast and a quick and easy soup to give your immune system a boost and fight off those nasty bugs and colds. Over the coming weeks I'll be sharing other recipes with you, which are packed with ingredients and fantastic foods to help with your winter wellness, whether its aches and pains, your well-being or to boost your immune system and ward off those nasty bugs. But for part one of this Winter Wellness Series lets look into what foods can help with strengthening your immune system and fighting off the sniffles. 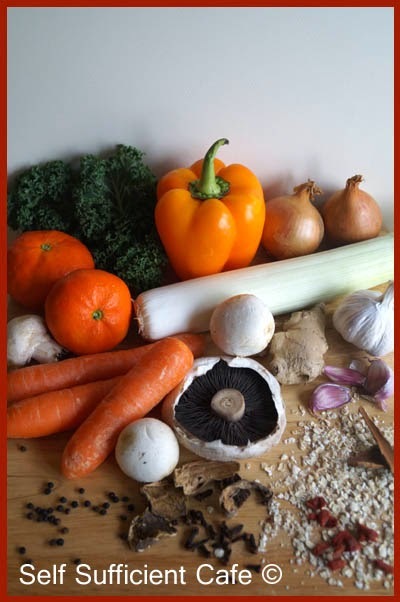 Foods rich in vitamins A and C and vitamins B6 and B12 paired up with zinc and iron are the foods that you need to boost your immune system along with less commonly known nutrients. Garlic - Thanks to its antibacterial and antiviral properties (to name a few) garlic will help boost your immune function. In fact garlic should be a regular ingredient in your cooking. Onions & Leeks - These vegetables belong to the allium family along with garlic and chives. They are rich in vitamin C and B6 as well as iron, making them a good choice to fight off a cold. Ginger - We all know the warming feeling that ginger provides you especially on a cold day so it's bound to be good for you right? Its a good source of vitamin C and it has many other healing properties such as settling an upset stomach or helping with nausea. 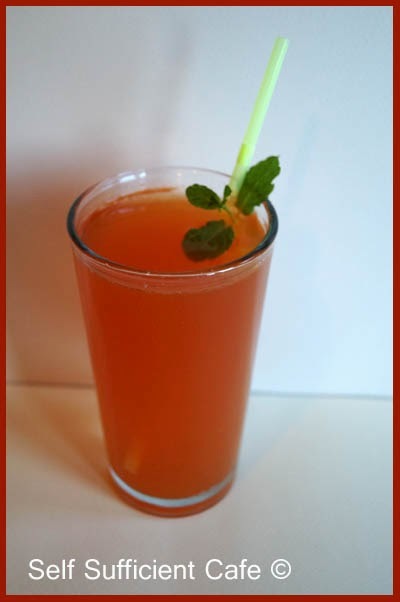 It will help soothe a sore throat and reduce your fever. Ginger tea anyone? Spices - Black Pepper, Cayenne Pepper, Horseradish, Wasabi, Turmeric, Cloves, Anise Seed and Cinnamon are all ideal spices to help fight of colds. Fennel - The bulb of fennel is an excellent source of vitamin C, while the fronds are a good source of vitamin B6, so be sure to use both parts. Red Peppers - High in vitamin C and E, in fact it contains more vitamin C than an orange! Eating foods high in vitamin C regularly will boost your immune system. 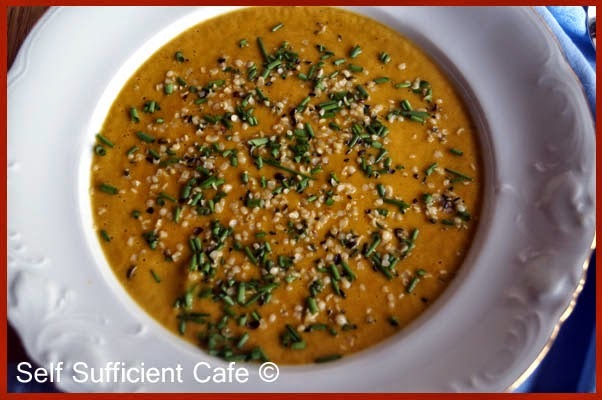 Sweet Potato and Carrots - Exceptionally high in vitamin A and a good source of vitamins C and B6. Vitamin A is important in maintaining a healthy immune system and if we do catch a cold vitamin A will keep our first line of defence functioning well. Mushrooms - Crimini and Shiitake are reported to be most beneficial to your health, but all mushrooms thankfully contain antioxidants which boost your immune system, they are also a good source of B vitamins and potassium. Leafy Greens - The darker the better, so opt for Kale, which is high in vitamin A, C, K, iron and calcium. It is the powerhouse vegetable and I cook with it a lot. This vegetable also contains all 9 essential amino acids which are required to form the proteins within your body. Get some in your diet now! Blueberries - Their colour alone should give you a tip to how good they must be for you, in fact come to think of it are they the only true blue food? The nutrients that give the blueberry its vivid colour are known for the natural ability to neutralise free radicals. Goji Berries - If you're looking for protein in a fruit then the Goji Berry is the one as it has the highest concentration of protein in any fruit. They also contain 18 kinds of amino acids, of which 8 are considered as essential amino acids. They are an excellent source of vitamin C and have 15 times more iron than spinach. Raspberries - They are rich in B vitamins and are another excellent source of vitamin C, along with vitamin E and iron. Oats - You probably already know that starting your day with oats will boost your morning energy levels but it will also boost your immune levels too. Citrus Fruits - Everyone knows that citrus fruits such as oranges and grapefruits contain vitamin C and whilst it might not be the food with the highest amount of vitamin C its still a good food to incorporate in your diet. Citrus fruit also has other health properties such as helping to heal cuts and repair body tissue. Soak the Goji berries in the green tea over night. 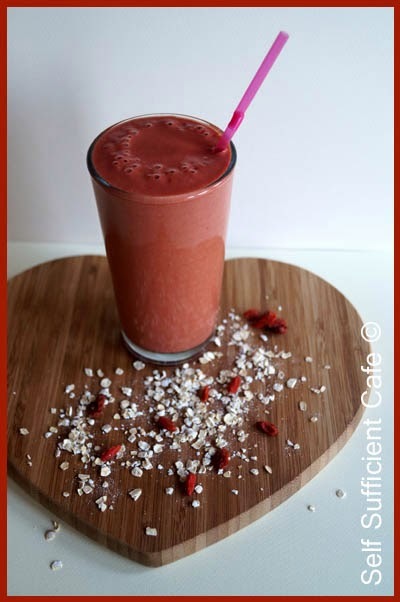 Add the Goji berries and green tea to your blender and add the frozen raspberries and hemp milk. Segment the satsuma removing the pith as you go and add to the blender and top with the oats. 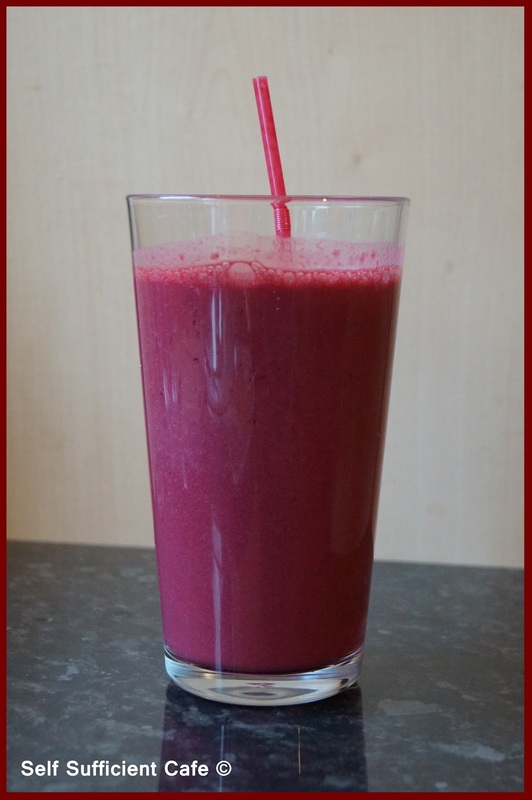 Blend until all parts have been incorporated and you have a smooth bright red smoothie. 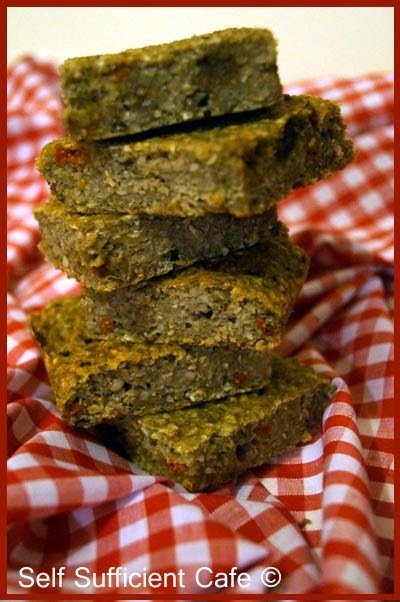 Cut the red pepper into chunks and throw onto a baking tray. Peel the carrots and cut into chunks and add to the tray. Peel and halve the onion and cut into half moon shapes and add to the tray. Peel the garlic cloves and add them to the tray whole. Next add the mushrooms halved. Give the vegetables a good dusting of black pepper and then drizzle a little olive oil over them. Massage the vegetables with your hands so they are all coated in the oil and black pepper. Roast in a moderate oven for 20 minutes or until the vegetables are soft. While the vegetables are roasting sauté the sliced leek in a little olive oil for 5 minutes then add the ginger, cayenne pepper and turmeric. Stir through the spices so the leeks are coated and sauté for another 2 minutes. Add the nutritional yeast and stir to combine. Add the vegetable stock and bring to the boil and simmer for another 10 minutes. Add the leek mixture to your blender and top with the roasted vegetables. 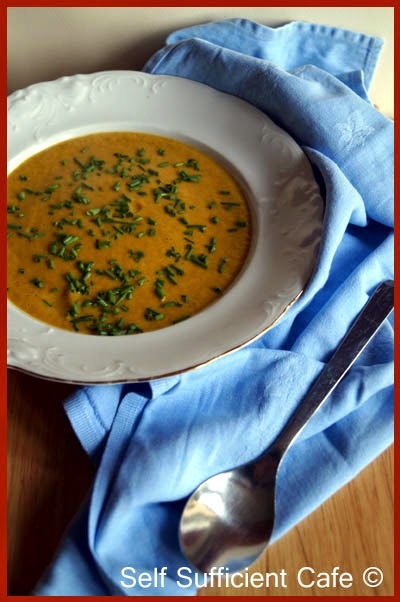 Blend until you have a smooth and silky soup. 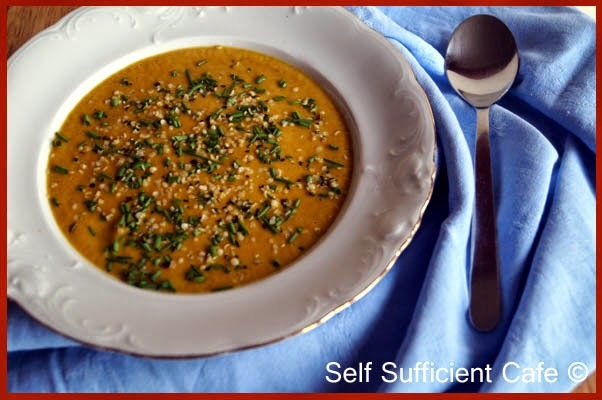 Pour into bowls and top with a sprinkling of chopped chives and a few hemp seeds. Enjoy! I'll be sharing more winter wellness recipes with you soon, please feel free to share your tips on how you stay healthy in winter in the comments below. I'd love to hear what you eat and do to keep those bugs at bay. Caroline from Tea and Sympatico left me a comment the other day asking about the aromatherapy blends I use to ward of bugs and colds. I'm a great believer in aromatherapy and I have found it has helped me in numerous ways. I am not a qualified aromatherapist but I have taken a course on aromatherapy blends and I will share with you the blend I frequently use in my home to help defend the winter colds and coughs. Drop the oils into the water and as the candle warms the water and oils the fragrance will circulate your room. If you want to use as a room spray, add water to a small spray bottle and add 3 drops of each. Shake before use. 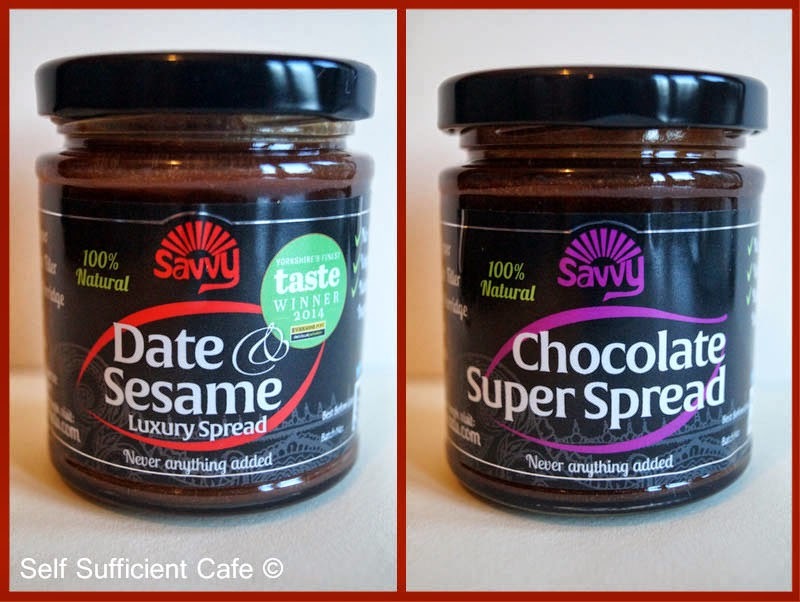 A while ago Katie from Savvy foods got intouch with me to ask if I was interested in reviewing the two vegan spreads Savvy foods make. 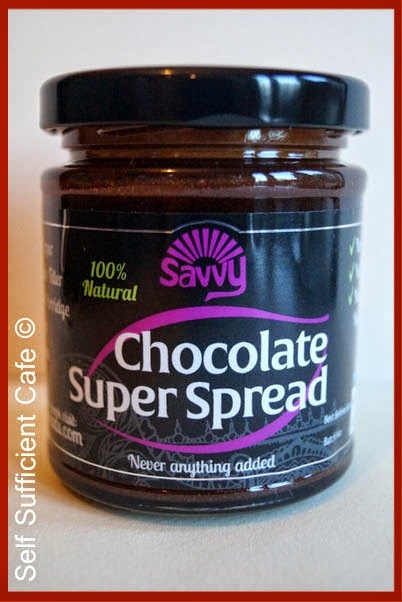 The two varieties are Chocolate Super Spread and Date and Sesame Luxury Spread. Of course I wanted to try them and I was more than happy to review, who wouldn't want to, chocolate was involved! So earlier on this month a parcel arrived and I couldn't wait to try them. The spreads are 100% natural and have no added sugar, oils, dairy, gluten, additives or GMO's, which makes them a healthier alternative to other sweet preserves on the market. Both spreads use tahini (sesame) as an ingredient which provides depth to their flavour and balances out the sweetness of other ingredients used. The tahini used in the Chocolate Super Spread (yes, it lives up to its name) is combined with carob, agave nectar, cocoa powder and spices to give it an individual taste which is not too sweet and has a hint of bitterness, not unlike a piece of good quality dark chocolate. 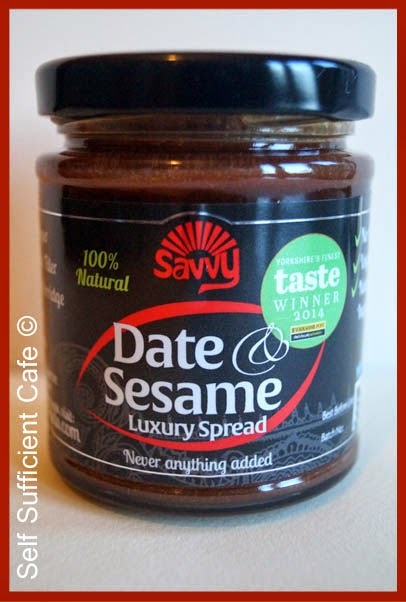 The tahini used in the Date and Sesame Luxury Spread is combined with dates, carob syrup, agave nectar and spices and has a rounded taste which was luxurious and therefore also lives up to its name. It reminded me of toffee, with the added benefit of not breaking your teeth! My favourite of the two spreads was the date and sesame luxury spread but it was a close call, a very close call! I'll let you into a little secret; the jar is sitting next to me, well what's left, which is not a lot and I keep dipping into it for another quick sample, it really is hard to stop going back for another taste! Suggested uses for the spreads include spreading on toast, crackers or pancakes and stirred into porridge or drizzled over ice-cream as a sweet topping. I wanted to go one stage further though, and try them out as an ingredient of a dish, could I cook with them and what could I make. I wasn't disappointed! The first dish I made didn't even need cooking, I was too eager to see what it was capable of and I made banana and chocolate ice cream and wow did it taste good! Even better it was actually good for you! Using my favourite piece of kitchen equipment I was able to knock this wonderful dessert up in seconds. 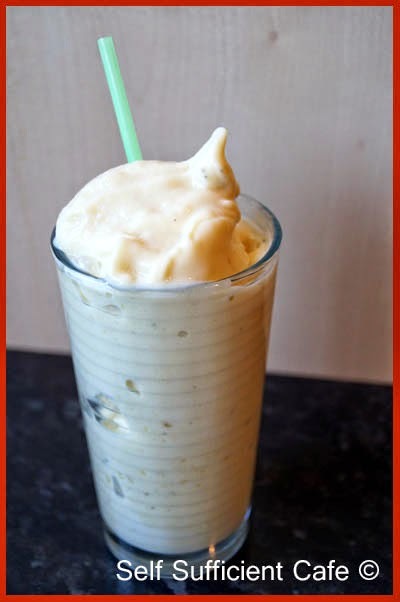 Put the ingredients into your blender (make sure you can use ice in your blender) in the order listed and blend until a soft serve ice cream is made. If it starts to melt just return to the freezer for 30 minutes before serving. Serve with a drizzle of the Chocolate Super Spread over the top and a sprig of mint. Next mix the flax seed with the water and put in the fridge for 10 minutes. 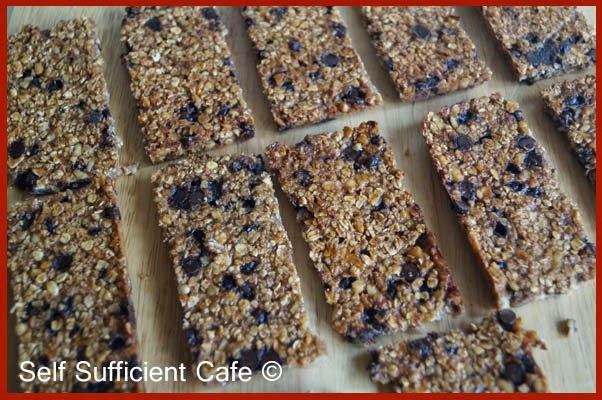 Line a baking tray or oven proof dish with grease proof baking paper so the oat bars are easy to remove. Place the date and sesame seed spread into a large glass bowl and heat in the microwave for 20 seconds just to loosen the spread. Slice the banana into the bowl with the date and sesame spread and mash. In a separate bowl mix the dry ingredients; oats, mixed nuts and chocolate drops. Take the flax mixture out of the fridge and add to the bowl of wet ingredients; date and sesame spread and banana and give everything a good stir. Transfer the dry ingredients to the wet ingredients and mix until everything is combined. Spread the mixture into the baking tray and bake for 15 minutes or until the top is golden brown and bubbling. 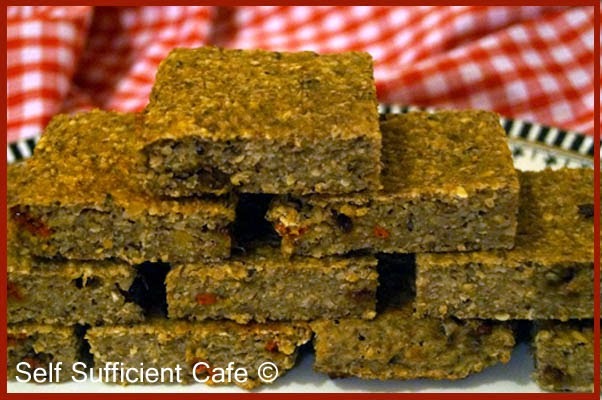 The cooking time will depend on the size of your baking tray and the depth of the oat bars. 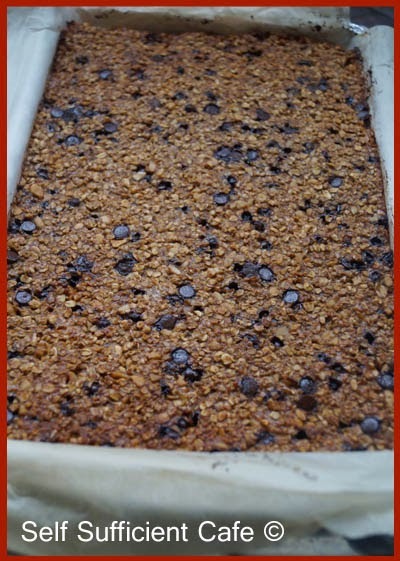 Remove from the oven and let sit for 10 minutes to cool down then tip upside down on to a board and peel off the baking paper from the bottom of the oat bars. Wrap individually in baking paper and store in the fridge or freezer if you want to store for longer. I'm so pleased I had the opportunity to try these two spreads and I'll definitely be buying more as they are so versatile. If you want to try them for yourself you can purchase them from a range of health food shops and more recently Suma! For a full list of stockists please visit their website. Previously I told you that after undertaking a little research I decided to include some of the most nutrient rich foods into my diet. My last post showed you how easy it was to include Spirulina into your diet by adding it to fruit shakes, much to the amusement of my colleagues at work! 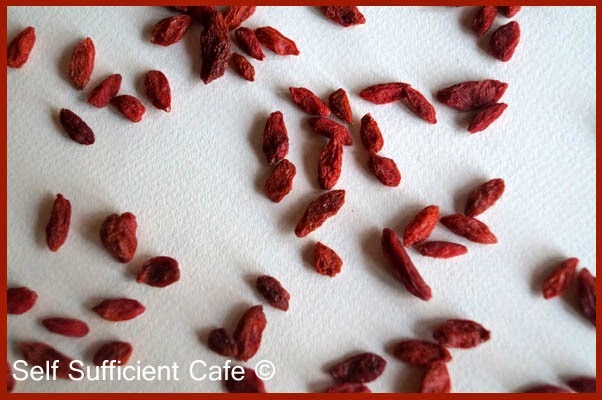 This weekend I've been experimenting with Goji Berries. 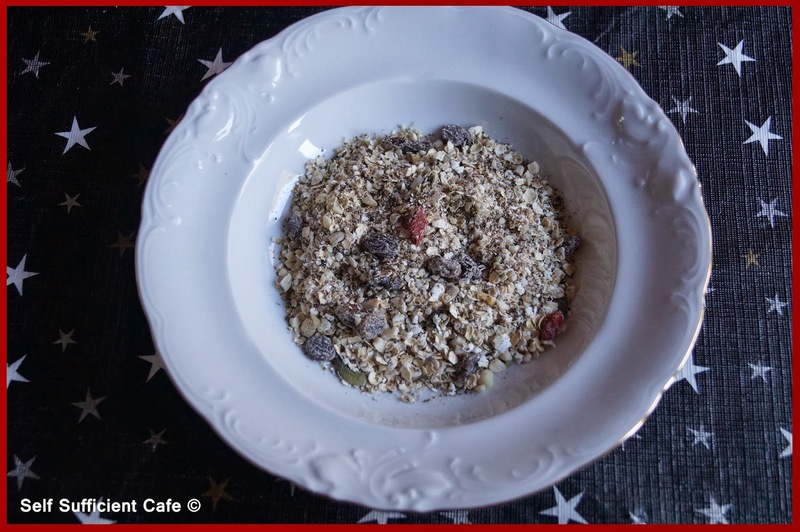 I already include them in my diet as they are an ingredient in my home made muesli, but I wanted to see what else I could make so that it wasn't just breakfast that I ate them. I gave up drinking back in September after one mother of a hangover suffering with a nasty headache and nausea. I didn't use to drink a lot, but I had found that the units per week had started to creep up. After a bad day at work I would pour myself a glass of wine instead of having my usual green tea with jasmine. So after the mother of all hangovers, I decided enough was enough and stopped! And do you know what I haven't missed it in the slightest even over the Christmas break! I've been enjoying my tea a lot more and trying different blends and drinking lots more water. Some people have even said too much water! 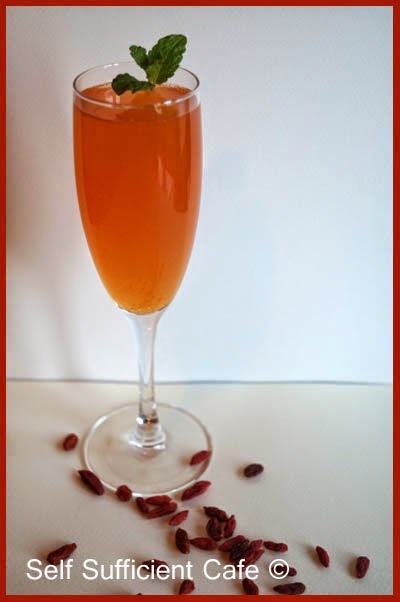 I wondered if I could make a drink using the Goji Berry and started experimenting. See what a mean a powerhouse berry for sure! We can only get dried berries over here, but they can be purchased from supermarkets or health shops so they are easy to find. As I was making them into a drink I soaked them over night so they would be easier to blend. 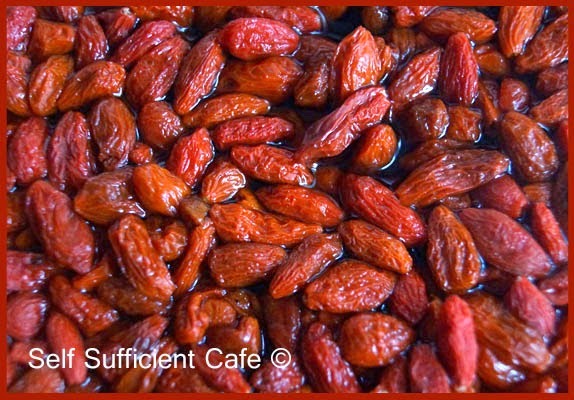 Soak the Goji berries overnight in the water. They plump up nicely! Transfer the Goji berries and the soaking water to a powerful blender, I used my faithful vitamix but any powerful blender should do the trick. Add the zest of the orange, the grated ginger and finally the agave nectar. 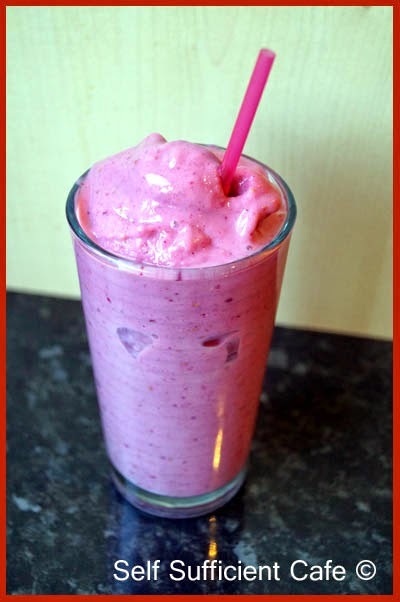 Blend until you have a smooth liquid, you may still have a few flecks of berry, but don't worry. Add at least a teaspoon of the mixture to a tall glass and top with sparkling water and serve with a sprig of mint. If the flecks of berry bother you then filter the drink through a fine mesh sieve, but remember if you do you'll be throwing out goodness. 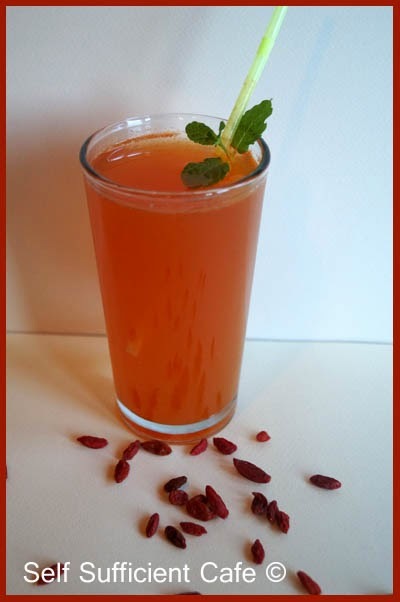 Play around with the ingredients, the above will give you a hint of orange to take away the bitterness of the Goji and the ginger just gives it a very subtle hum of warmth. I'll definitely be trying more drink creations with this little berry, I think mint would work too instead of the orange, but you could also try lemon or lime. Personally, I don't like the term superfood, especially how it has been banded around the media over the last few years. You don't hear the terminology "superfood" referred to with carrots do you? But to me carrots are one of the healthiest foods out there, if you don't believe me do some research yourself, you'll be amazed at the power of a carrot! 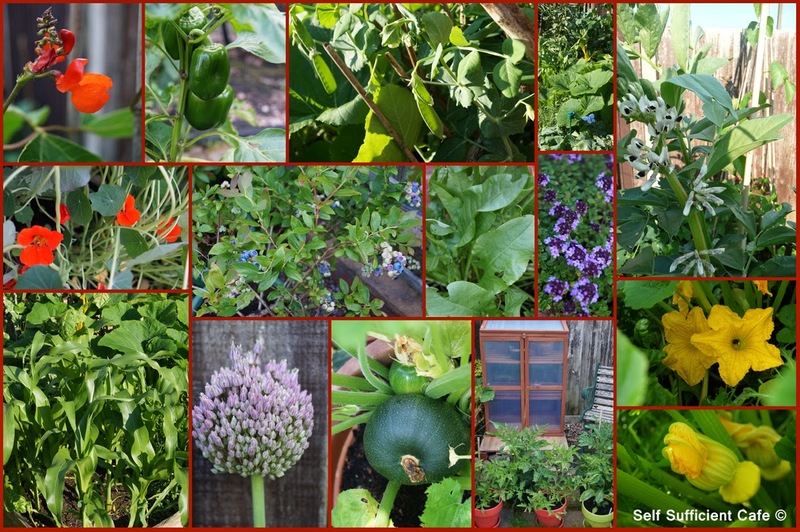 This month I am focussing on "nutrient rich foods" which are high in a number of vitamins and minerals, which are said to have a number of health benefits. They are the most potent and super concentrated foods you can find, which will improve your overall health. Now, I'm not a dietician or medical expert but an individual who after undertaking research for myself has decided to include some of these foods into my diet. Today, I'm focusing on Spirulina, which is a blue-green algae which is found on water. In other words its like pond scum, but that doesn't sound appetizing at all does it? So lets stick with calling it Spirulina, it sounds far more appealing and kind of exciting! Spirulina provides a vast array of minerals and my research has unearthed that it is the worlds highest source of complete protein! In fact around 65% of Spirulina's dry weight is protein. Spirulina also has over 100 types of nutrients including B complex vitamins, which is great news for vegans. There are many reports of health benefits associated with Spriulina although it appears that more research is needed before it can be determined whether or not Spirulina can treat certain health conditions. To strengthen my immune system so I'm less likely to experience colds and other winter bugs. To help with inflammation, it is said to be one of the most powerful anti-inflammatory agents in nature. To ease my heyfever symptoms, it is reported that Spirulina can alleviate allergies. Since transfering to a vegan diet my heyfever is mild into comparison what it has been previously so I'm all for an extra boost to make it disappear altogether! So, how can you introduce Spirulina into your diet? The easiest way is by adding a teaspoon into your juices, smoothies or just adding it to a glass of water. But I wanted something a bit more exciting than that, enter fruit shakes. 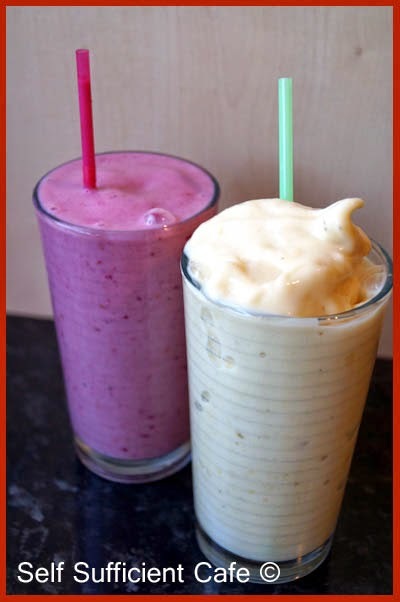 Fruit shakes have the consistency of a milk shake but use frozen fruit instead of milk.Thanks to my beloved Vitamix I can make fruit shakes in 2 minutes flat, which includes cleaning up afterwards! Any powerful blender should work though, just make sure it is suitable for ice! I've been playing around with fruit shakes for a while now and I have three out right favourites, strawberry, raspberry and a combination of mango and pineapple. 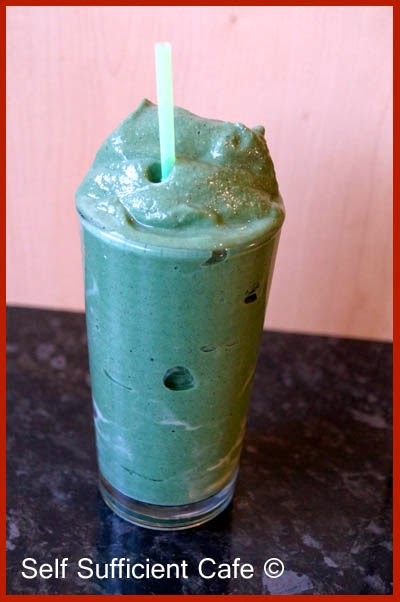 Just add a teaspoon of Spirulina to the mix and there you have it a green fruit shake. When they are first made they are the thickness of soft serve ice cream, in fact I can hold my jug upside down and they don't budge. But after transferring to a glass they soon start to melt a little and are easy to drink through a straw. I make one every morning, transfer to a plastic cup so I can transport it to work and as soon as I get to my desk its ready for drinking, delicious. In fact I'm drinking my green fruit shake right now! Take any of the recipes below and add 1 teaspoon of Spirulina to your blender and whiz up! My favourite to add the Spirulina to is the mango and pineapple fruit shake as you get such a vivid green colour. 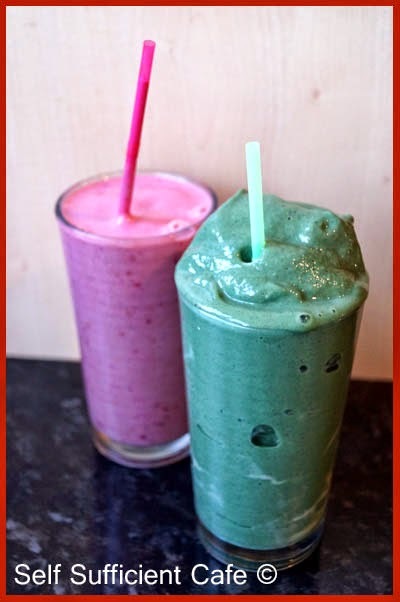 The raspberry and strawberry fruit shakes are more brown than green in colour. Any recipe you choose though is delicious. 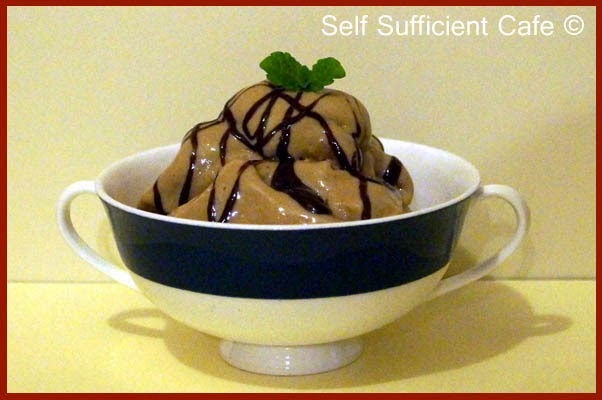 Add the ingredients to your blender of choice in the order above and blend until you have a smooth consistency similar to soft serve ice cream. I have to use a tamper with my Vitamix machine to push the frozen fruit down towards the blades. Sorry I'm late! I actually can't believe that its the 10th January already! 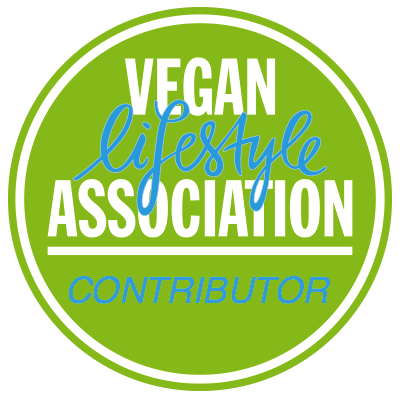 Veganniversary - A look back over the last 2 years and how my health and wellbeing has improved. 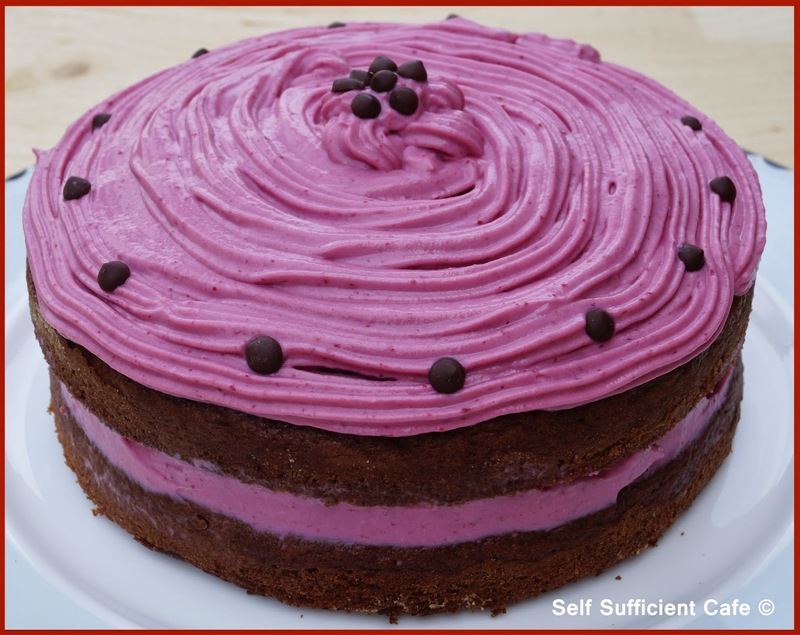 New Year is also my veganniversary and this year I am celebrating two years. The main benefit I've noticed is my health. I used to suffer with headaches, there wasn't a day that went by without me suffering. I was also prone to getting a head cold or worse as soon as I stopped. Every year when I broke up for a holiday or Christmas instead of enjoying my time off, relaxing and filling each day with fun, I was always warding off a cold or bug of some sort and the worse thing I suffered with was cold sores! Whenever I got run down, which seemed a lot when I look back I didn't just get one cold sore but I'd get a whole fat lip covered in the little buggers, inside and out. It was so painful and it hurt to drink, which was always through a straw let alone eating! There was no over the counter medicine that would even touch the little blighters, it always meant a trip to the doctors where I was prescribed tablets to help clear them up! Since turning vegan I haven't suffered massively with cold sores although I did have a rather nasty break out in May 2013, five months into transferring to a vegan diet. I did however combat the breakout with food. 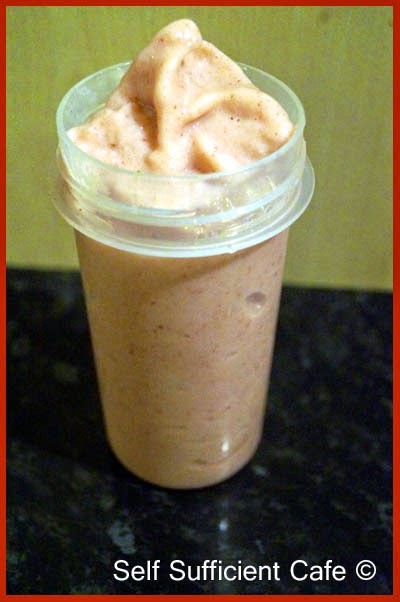 Back in May 2013 after doing a lot of research I created a couple of cold busting smoothies; 1) using strawberries and 2) using pineapple. Did they work? Yes they did without taking a trip to the doctors, my preference was the Pineapple smoothie. Thankfully since that last outbreak I haven't suffered another apart from one little cold sore which was nothing compared to what I used to get. Another great thing is that I no longer suffer with headaches, OK I have the odd one now and again who doesn't, but these days I wake up feeling great and I have more energy. One thing I love is turning that energy into growing my own food. Some of you may know that leading up to Christmas it was a very stressful time. My Dad was very poorly and after 3 months of worrying times where he was rushed into hospital 4 times, had two operations and had to stay in hospital for over a month, we were all pleased that he managed to be home for Christmas. After daily visits from the district nurses I'm pleased to report that he is making good progress. Thankfully even though it was an extremely stressful time my health didn't suffer and I managed to stay in tip top form to support my Dad along side my Mum and sister. These Christmas holidays I have been surrounded with people who are ill, hubby has had a nasty chest infection which made him ill all over the Christmas holidays and is only just starting to feel better. All my friends and family have been prone to an illness of some sort too, mainly with nasty colds and coughs. Everywhere I go I seem to be the only one who isn't ill! When I went back to work earlier this month it was like walking into a doctors surgery waiting room! So, I am very fortunate not to have succumbed to one of the nasty bugs flying around. Don't get me wrong there have been days where I have thought "O-oh I'm coming down with something" but after a good nights sleep I wake up the next day feeling fine. So, what do I put this down to, diet? sleep? exercise? aromatherapy? All of the above! My diet is the healthiest it has been for years, 5 a day is no problem for me and its normally like 10 a day! My sleep pattern is getting better and most nights I manage to drift off not long after climbing into bed. My exercise regime is better too thanks to my wonderful furry friend Marco! 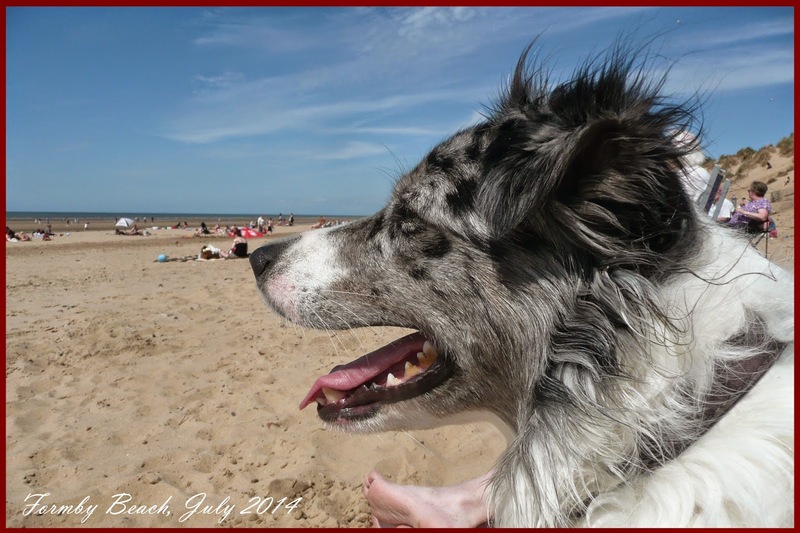 A bouncing border collie who is always up for a walk or a game of football or fetch. Then there is aromatherapy, some time back I did a course on aromatherapy blends and it was one of the best things that I ever did. I always have an oil burner on the go or I use a room spray that I have made to combat bugs. I love my aromatherapy baths where I can soak for what seems like ages in total relaxation. I also use it to help me sleep and a quick spray of one of my blends on my pillow always helps me drift off into dreamland. Now, don't get me wrong, I am nowhere near where I want to be with my health and wellness but I've started my journey and I'm enjoying the ride. I could still be healthier in what I eat, yes I do fall off the wagon and indulge in a whole family size bag of crisps or a whole packet of biscuits, always vegan of course! Sometimes I wish there was no vegan junk food to tempt me! But then again, a little every now and again can't be too bad for you. You would only end up craving it more. My one big thing with my diet is portion size! I just LOVE food! There I've said it, if something tastes good then I want more of it! Looking to the future and how my journey to becoming a happier, healthy and less stressful individual continues. How I am going to do this? I'm working to get my cravings in check, by understanding my triggers and knowing how to combat them, I will control my portion sizes, and learn to identify when I am full! I hope to ditch refined sugar by utilising natural sweeteners such as dates. The benefits of doing all this is to hopefully lose some weight. I also need to find some other form of exercise! Ideas in the comments please! The excuses: I've tried running but I get bored, running with Marco is not ideal as he always wants to go faster than me! I love Orienteering but its an expensive sport and in order to partake in an event each weekend you need to travel a lot, and I mean a lot! The enjoyed: Walking Marco, sometimes we are out exploring all day so its a great way to burn up calories. I also enjoy my gardening which is a great calorie burner, but I need to find another form of exercise that I enjoy. I'd love to be able to start up my yoga again, which I had to stop due to injuries which meant I didn't enjoy it as much. Every time I try to start it up I inflame one of my injuries. It's a catch 22! One other thing I want to master or improve on is my meditation, I truly believe those that meditate are less stressful and more healthy individuals. You don't need any fancy equipment to meditate and you can do it anywhere so there are no excuses, you should give it a try if you don't practice already. Of course, my blog will be a place where I will record my progress to becoming a happier, healthier and less stressful individual. It will also be full of tasty healthy food for you to try as I share my 'improved health through food' journey with you. This month I'll be focusing on nutrient rich food and how you can incorporate them into your diet.